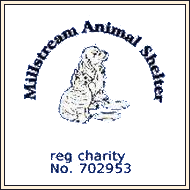 Millstream Animal Shelter is dedicated to improving the lives of animals in the local area but being financially independent means it is entirely reliant upon local support to help fund its work. We are a charity taking in cats, dogs, rabbits and ferrets. All our animals are neutered and for those who cannot find a home we provide one within our shelter. We also offer advice and support to owners enabling them to keep their pets.